Check the US Production Price List and the Overseas Production Price List for the Book Match prices and Rush Order prices. Click here for more information on match tip colors. 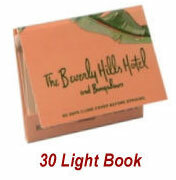 Wagner Match has been providing businesses with custom made marketing products for over 20 years. At Wagner Match, we create and customize book matches, drink coasters, scratchpads, and other fun accessories with your business information and logo so that your customers have something to walk away with. We offer a wide range of products for you to choose from so that you can easily promote your business in an exciting and cost-effective way. 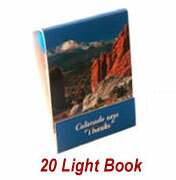 Wagner Match customized book matches and products provide a refreshing experience for your customers. With so much advertising taking place on the internet today, it can be fun for your customers to have something tangible to hold on too. Our services allow you to promote your company or service in different unique ways that will help people remember your business. At Wagner Match, we can customize all types of products with your company logo, slogan, or image to really make an impact. Choose our large selection of products like toothpick packs, sugar packs, dinner mint packs, scratchpads, and book matches that you can give to your customers. At Wagner Match, we have the products and services to help you promote your business in a fun and affordable way. With Wagner Match, getting custom products made is easy. Just send in your logo or artwork and our professionals will help you create something special. By giving your customers fun promotional items to take home, you can market your business while giving them something they might actually use. 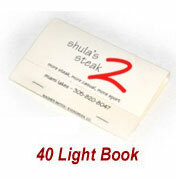 Customized book matches, or dinner mint packs can be the best way to have customers talking about your business.